OSLO: A Norwegian navy frigate and a Maltese oil tanker collided in a fjord in western Norway Thursday, local authorities said, with seven people receiving minor injuries. 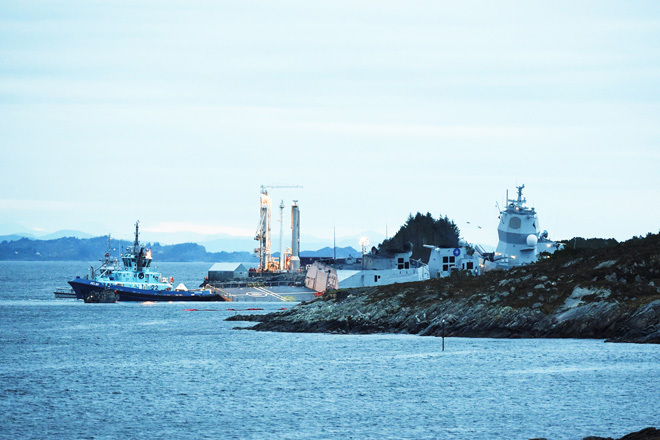 The KNM Helge Ingstad frigate, which was returning from Natos Trident Juncture exercises, was evacuated after the collision with the Sola TS tanker, Norways army said. It took on a lot of water and there is a real danger that it sinks where it is, an official for the Sola rescue centre told AFP. An image published by Norwegian broadcaster NRK showed that water had almost reached the level of the frigates helicopter platform. A small oil slick from the frigate has been detected but nothing large, the official added. The circumstances of the accident, which took place shortly after 4.00am in the Hjeltefjord near Bergen, are not yet clear. The armed forces is now reviewing all the means available in the region to assist the KNM Helge Ingstad, Lieutenant Colonel Ivar Moen told AFP.